What kind of space -- literary, cultural, socio-political, psycho-emotional -- does a Nepali writing in English have in Nepal? And in the world? 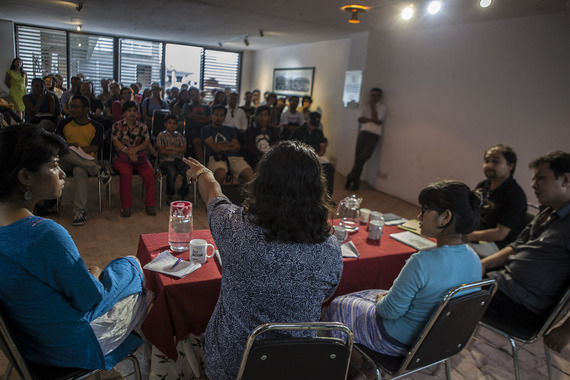 This has been one of the guiding questions driving La.Lit's team, headed by Editor Rabi Thapa, with Prawin Adhikari, Pranab Man Singh and Rajani Thapa as Assistant Editors. One can surmise the challenges of investigating a question so wide and deep. One can also surmise that the process would be incomplete without touching base with Nepal's larger literary circle -- Nepalis writing in Nepali. And so it's been fascinating to stay on the sideline, witnessing Team La.Lit move forward with their agenda, tackling the issue head on by inviting a diverse group of writers -- Nepalis writing in English, Nepali and other languages, along with international contributors -- on this exploratory journey. The consequence of this multipronged collaboration, this undertaking -- call it whatever you want -- can either be accessed online or in its more traditional, tangible versions. 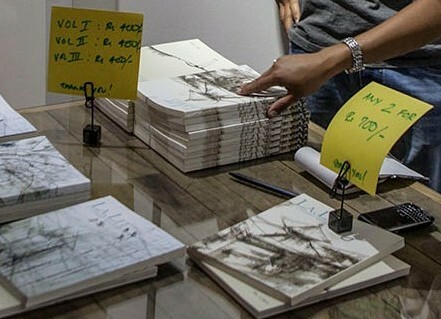 La.Lit officially launched its third print volume -- a compilation of stories, essays, reviews, translations and other forms -- on Saturday, August 9, at the City Museum of Kathmandu. 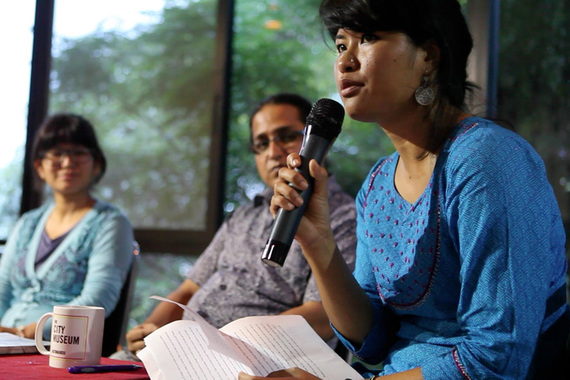 The launch was preceded by a panel discussion moderated by Nayan Sindhuliya. It's no surprise that Sindhuliya's questions were more like sub-questions, an attempt to unravel and understand the bigger guiding question. Elements such as agency, authenticity and access kept propping up as contemporary Nepali writers Muna Gurung, Yug Pathak, Weena Puna and Buddhisagar (photographed above in this order, left to right) grappled with these themes and thought through their responses. On authenticity -- Who is a Nepali writer and what does that really mean? Yug Pathak started with Bhanubhakta. He reminded us that the Aadikabi's image was invented in Darjeeling. Nepalis living abroad, tired of being subjugated, created a history of Nepali language, something they could rely on and be proud of. But that myth inevitably excluded large chunks of Nepalis -- Madhesis, Janajatis, etc -- who had always spoken different languages. And what about correct Nepali? A lot of Nepali academics insist on a certain kind of grammar and style? Could you comment on your style in Karnali Blues, Sindhuliya turned to Buddhisagar. The simplicity in the novel's language, which is interspersed with Tamang and Tharu dialects, is striking. 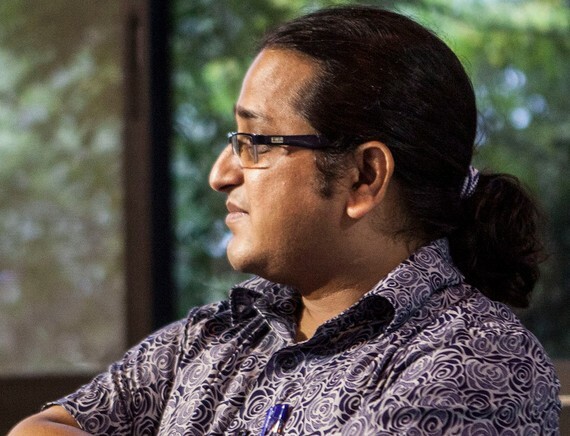 Buddhisagar quoted Toni Morrison -- "If there's a book you really want to read but it hasn't been written yet, then you must write it" -- at the beginning of his response. My background was poetry, he went on. I like simple language. I believe that literature should be like a folk song. Simple, easily understood by many but having complex meanings that can be interpreted in various ways by different readers. I have used a lot of short sentences in Karnali Blues because I felt that that style could capture the situation and the characters' reactions more accurately. I developed the style as I wrote the book. Sindhuliya then asked Weena to comment on the English language. Would she be able to portray the life of a Nepali village -- the subject matter of a novel that she is working on -- successfully in English? I didn't think of the language at all at first, said Weena. But when I started to write the novel, I became more aware of it and it bothered me. Certain Nepali expressions can't be translated into English in the same way. But I love English; switching to Nepali would not have been a solution. So do you think Nepalis writing in English do justice to the Nepali experience? This was a question for Muna Gurung. That's a loaded question, remarked Muna. And after a brief pause, continued. As a writer, my biggest fear is the Nepali audience. But I read English writing by Nepalis in two different ways. As a reader, I am excited about Nepalis writing in English. I don't think I have the right to judge them. And as a writer, it's fascinating to discover different ways to talk about Nepal in English. What is the Nepali experience really? I have Gurung parents who aren't very educated. I spent my childhood in Singapore and then I came to Kathmandu when I was twelve. That's my Nepali experience. Everyone has a different one. I say, forget about authenticity. Sindhuliya asked Yug to comment on the distance between Nepali language and other languages. It's a theme that Yug explored in his novel Urgen Ko Ghoda. 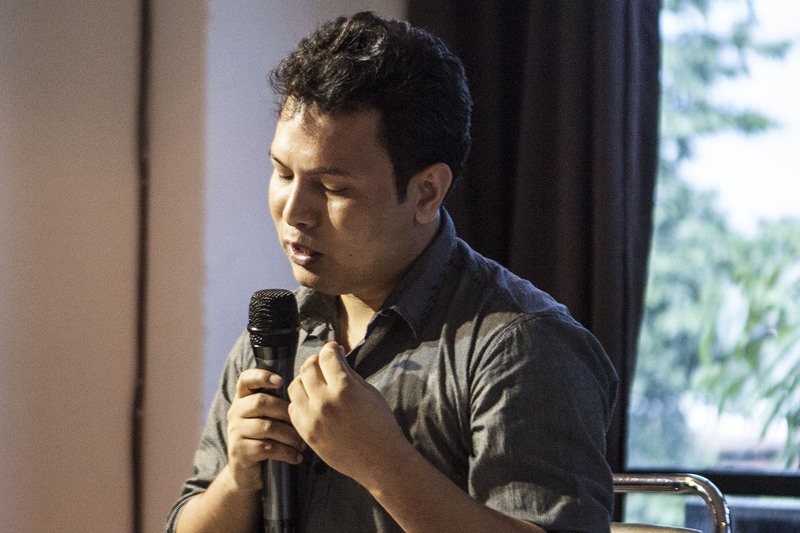 "Sixty percent of Nepalis don't read writing written in Nepali," said Yug. That's because we haven't been able to reach a big part of Nepali population. Why would they read writing that doesn't convey their experiences? Language should accommodate everyone's experiences. English is democratic in that sense. It has been able to accommodate a wide array of experiences - Nepali, Indian, Latin American and African. Do writers read enough? was Sindhuliya's next question. Have you read enough Nepali books? Yes, I do, responded Weena. These days I read more for information because I realize that I know so little about Nepal. Muna admitted that she didn't read enough Nepali literature. And that's because, she went on, I was traumatized by Nepali in school. I feel that reading and writing is so personal. If there are barriers such as authenticity people get intimidated. That's why I welcome all kinds of unconventional writing - poems through text messages, social media, etc. As a segway, "You said you hated Nepali, that brings me to the issue of translation. What do you think about translation to and from Nepali?" asked Sindhuliya. Muna replied that translation can be fun. She read an English translation of Sirish Ko Phool but felt that the translation was not very good so she attempted to translate it herself. Buddhisagar mentioned that Michael Hutt had started translating Karnali Blues but he stopped after some forty pages. I think it's more important to translate other languages into Nepali, he continued. Translation is difficult. It's difficult professionally and it's also a complex process. One has to have a good command of both languages in order to do a satisfactory translation. You mentioned that translation is fun, Yug piggybacked on Muna's earlier comment, but for me it's about power. 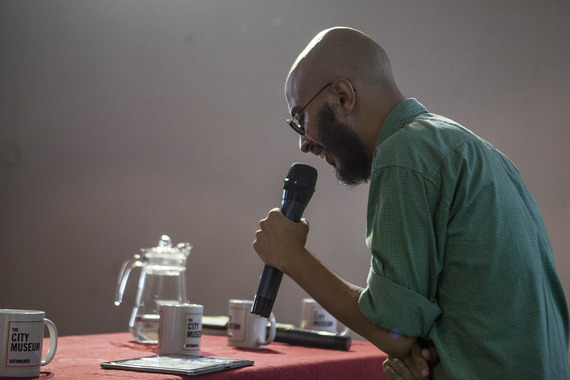 I want my novels to be translated so that our experiences can be conveyed to the rest of the world. Forget about all the textbooks that continues to glorify all the resources that Nepalis have. We don't have anything. Our unique experiences are all we have. That's why translation is a must. Karnali Blues and Urgen Ko Ghoda are both critically acclaimed novels written in Nepali language. 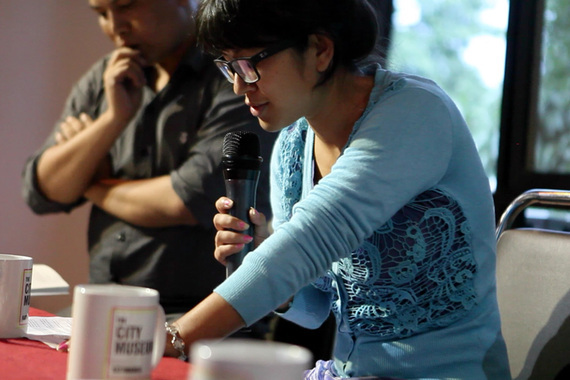 Muna Gurung is a New York based writing instructor. Her story, which won the second prize in Writing Nepal, can be found here. It's also included in La.Lit's second print volume, along with Weena Pun's and many other English language stories written by Nepalis. This blog is an independent report and does not reflect the views of La.Lit magazine. Pranaya Rana read an excerpt from his upcoming English language novel at the beginning of the event.